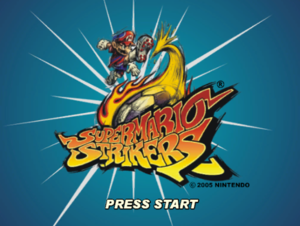 This page details one or more prototype versions of Super Mario Strikers. Put screenshots of prototype character models from Models Resource into the prototype page. Rip and compare stages, music, and sound effects. 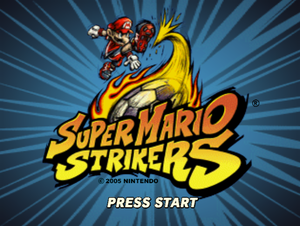 A demo of Super Mario Strikers was released on Interactive Multi-Game Demo Disc Version 31. The demo features a lot of leftover E3 stuff that it could be enabled in the user.ini file. In the user.ini file, the file contains this. replacing "true" with "false" will change some of the features. 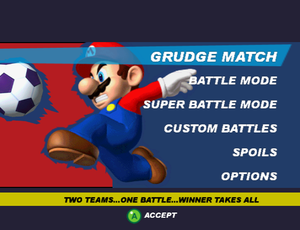 e3_build enables the save feature, the E3 character selection with more characters, stages, and options. fev2 enables a fix when the characters don't show up at the character selection. It also enables the E3 side screen, and the E3 pause screen. newloadscreen enables the E3 loading screen. You can also enable it by using this code here. Sidekicks can do Super Strikes. Some sound effects are missing. 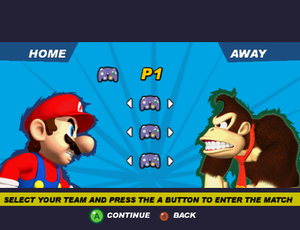 The demo uses the early logo, and Mario wears an different outfit. 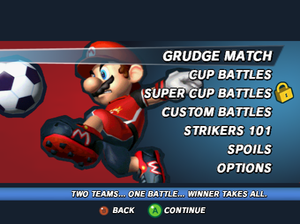 Mario is shown wearing his normal outfit rather than his soccer outfit in the final, The soccer outline has flames in it, The "Cup Battles" and "Super Cup Battles" are originally known as "Battle Mode" and "Super Battle Mode", "Accept" was changed to "Continue", The "Back" button is missing as well as for the lock icon, Strikers 101 is missing, And the info box is yellow. 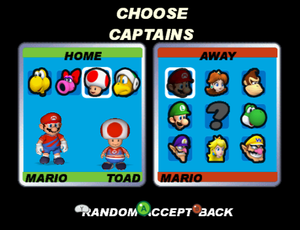 The E3 version features a very early character selection screen along with some characters that have different outfits. 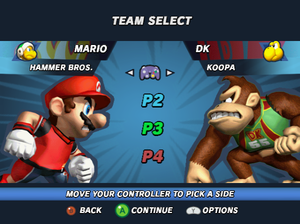 In the demo, Mario and Donkey Kong doesn't wear their soccer outfits. The background is simpler, and the outline around the characters is more jagged. The early kick off screen which shows the word "KICK OFF!" and a rolling soccer ball was replaced with Mario kicking the soccer ball. This page was last modified on 27 June 2018, at 18:00.